A few days ago there appeared a new trailer for Medal of Honor and with it, made it clear the launch date for this game on PS3, XBox 360 and PC: October 12, 2010. For some reason in the same trailer (but in its official game site) appeared a resounding "Pre-order now. Beta coming soon”. 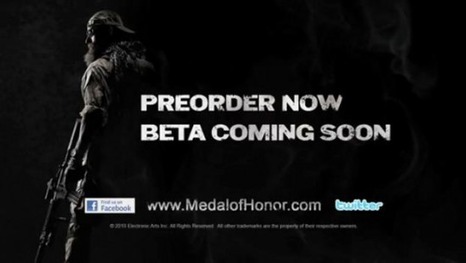 The reason why this important announcement was not released in the first version of the trailer is unknown so far, but it is clear that Medal of Honor is in addition to what you are doing with so much noise Halo: Reach at this time: MoH will be a multiplayer beta. If the game appears on 12 October is likely to see the beta about 30 days before launch. Multiplayer section is provided by the Swedish DICE, so we know the potential of the series and gives the developers to wait for the beta in question. The requirements to access it and for which platforms will be available, is a mystery ... but I think we'll know more about it soon.